Solar spheres: By depositing nanoparticles made of silver on thin-film photovoltaic cells, Kylie Catchpole increases the cells' efficiency, which could make solar power more competitive. 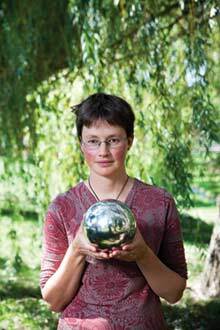 Solar spheres: By depositing nanoparticles made of silver on thin-film photovoltaic cells, Kylie Catchpole increases the cells’ efficiency, which could make solar power more competitive. In 1995, finishing her undergraduate degree in physics, Kylie Catchpole decided to take a risk on a field that was nearly moribund: photovoltaics. “There was a sense that I might have difficulty ever being employed,” she recalls. But her gamble paid off. In 2006 Catchpole, then a postdoc, discovered something that opened the door to making thin-film solar cells significantly more efficient at converting light into electricity. It’s an advance that could help make solar power more competitive with fossil fuels. Thin-film solar cells, which are made from semiconductor materials like amorphous silicon or cadmium telluride, are cheaper to produce than conventional solar cells, which are made from relatively thick and expensive crystalline wafers of silicon. But they are also less efficient, because if a cell is thinner than the wavelength of incoming light is long, that light is less likely to be absorbed and converted. At just a few micro­meters thick, thin-film cells only weakly absorb wavelengths in the near-infrared part of the spectrum; that energy is lost. The result is that thin-film photovoltaics convert 8 to 12 percent of incoming light to electricity, versus 14 to 19 percent for crystalline silicon. Thus, larger installations are required in order to produce the same amount of electricity, limiting the number of places the technology can be used. Plasmons are a type of wave that moves through the electrons at the surface of a metal when they are excited by incident light. Others had tried harnessing plasmonic effects to make conventional silicon photovoltaics more efficient, but no one had tried it with thin-film solar cells. Catchpole found that nanoparticles of silver she deposited on the surface of a thin-film silicon solar cell did not reflect back light that fell directly onto them, as would happen with a mirror. Instead, plasmons that formed at the particles’ surface deflected the photons so that they bounced back and forth within the cell, allowing longer wavelengths to be absorbed. Catchpole’s experimental devices produce 30 percent more electrical current than conventional thin-film silicon cells. If Catchpole can integrate her nanoparticle technology with the processes used to mass-produce thin films commercially, it could shift the balance of technology used in solar cells. Thin-film photovoltaics could not only gain market share (they currently have just 30 percent of the market in the United States) but sustain growth in the solar industry overall. Catchpole has been approached by companies, but she wants to refine the technology further before commercializing it. Meanwhile, researchers at Swinburne University of Technology in Melbourne are collaborating with Suntech Power, one of the world’s largest manufacturers of silicon solar cells, on plasmonic thin-film silicon cells of their own. The company’s plasmonic photovoltaics are expected to be ready for production within four years. Nice article and excellent research. Bravo. While silicon is quite abundant, silver has about the same abundance as cadmium and tellurium, as well as a much higher price (reflecting its other uses). So how much silver is required for this application to thin-film silicon solar cells? How does this compare with the cadmium and tellurium required for thin-film CdTe cells? I'm sure there are other metals that possess similar traits of reflectivity. Being stupid in the realm of metallurgy and optics, I am only guessing. Thank you so very much for bearing with me! Maybe molybdenum? It's fairly abundant. Perhaps if it's deposited lightly, it might reflect. It's already used as a bottom layer on stainless and an obverse coating on polyimide in some CIGS applications. Leave silver for the grid pattern as it's used for right now on the back end. The metal needs to be able to support a plasmon resonance for this to work. Unfortunately, the only metals known to do this with low damping in the visible region is Au and Ag. Cu and Al are the only possible alternatives, although these come with significant complications that need to be overcome (high damping in the case of Cu and a plasmon in the UV for Al). However, some of the work by Richard van Duyne (done by a friend of mine!) starts to address these concerns for both Cu and Al. Look up his papers if you're interested. I am less familiar with amorphous silicon, but absorption is not an issue with CdTe. Layers a few micron thick absorb almost all light above the bandgap. Higher levels of impurities are more of an issue. If I am reading the article correctly, the application of silver to thin-film PV's would increase their efficiency from a maximum of 12% to something like 15.6% (i.e., 30% more current than now). Given the alternate uses of thin-film to silicon, this seems useful, but it only seems to be approaching the bottom range for silicon's efficiency (quoted in article as 14-19%). "30% higher than current conventional thin film" maybe the author intends to project 18% to 25% which would put it in the higher bracket of existing capacities of conventional silicone cells. My company in New Tripoli, PA already does this using different materials than silver. We are at the commercialization stage. Nevertheless, a very good article and good work by the young lady. I hope this comment is posted as I am an Oxford grad not an MIT grad. Harry Potter Works on Plasmonic Solar Cells??? 1. Please post a link to the paper that shows they've clearly identified and separated plasmonic effects from light scattering due to texture. If they clearly prove plasmonic action, I think that's wonderful and awesome. Otherwise, chemical etching, or sprinkling on some diamond/nitride dust might work just as well. 2. The main issue is not really in just absorbing more light, but absorbing it in those first few microns where the carriers can be extracted. Amorphous (thin film) Silicon is crapola <= 10% efficiency. This will most likely have a very marginal effect on the 14% + efficient poly / multicrystalline cells which constitute the bulk of solar installed to date. 4. "First Solar, the market leader, is planning gigawatt-scale solar farms that will use cadmium telluride thin-film technology to deliver as much electricity as conventional power stations." Maybe you mean as much peak power - typical solar installs have a capacity factor less than 30% with FSLR being way lower since they usually don't track the sun. Silicon's the way to go tho. Fo sho! Better not forgotten, Titanium oxide nano crystals are quite good in efficiency, may not be as high as silicon, if these Self Assembled layers can work on these solar cells, then increase in efficiency could be well considered in terms of the cost of production which is high for silicon. Hi ashrocks, just to respond to your point (and do a little cheerleading if I can), plasmonics can help in a wide variety of different photovoltaic applications, including the dye-sensitized system. Basically these nanoparticles are very good at concentrating light on their surfaces, essentially like nano-antennae. So in conjunction w/ any sort of photovoltaic system, metal nanoparticles if engineered and positioned properly can aid in concentrating the light at specific nanometer-localized spots. Green presented a comprable mechanism ( he was likely the PI here ) at a conference ~2008 with comprable increases in thin film silicon PV that had ~30% increase on a ?3-5% starting thin silicon layer. Since BOS costs have always dominated photovoltaics overall costs, ANY cell technology below say 15% total conversion is marginally competitive - almost useless "economically" in the real world ( outside of "academic" claims ). The article seems to miss that the mechanism the particles are used for, is merely a modest loss surface deposited optical scatterer, as an optical mode convertor for ambient incoming light - into a larger useful fraction of lateral coupling into/ inside the thin film pv layer. While plasmonics is an interesting area of nano-optics research, the intended optical function produced by the research is primarily increasing thin layer PV conversion via principally mode converting incoming light that has poor absorbtion efficiency in thin layers, to a useful fraction of laterally coupled light in the thin semiconductor PV convertor layer. I suspect there are commercial products using a comparable mode converting effect ( when one acknowledges this as the primary mechanism here ) from other "unnamed" firms, and even applied to crystalline silicon cells ( versus thin film cells ). Using different materials for the scattering effect, even buying some limited increase in efficiency in thicker crystalline cells - but smaller relative % than the 30% relative increase seen in very thin inefficient films here in this work.